Tuesday July 1 at roughly 7 AM, Darcy Burner's home burned down. The fire started in the room of 5-year-old Henry Burner, in his lamp. Henry rushed out of his room and told his Mom, who got everyone (but the family cat) out safely. The fire spread quickly. It burned the home to the ground. Darcy, her husband Mike, and little Henry are all fine. Her 5-year-old son, Henry, came into her and her husband's bedroom around 7 a.m. screaming there was a fire in his room, Burner said. "I scooped him up and got him out of the house," she said. Everyone, including the family's golden retriever Bruce Wayne, made it out uninjured, but their cat did not survive. Burner said she hadn't yet considered whether the fire would impact her campaign. "I am today focused on my family and just really grateful that my family is OK," she said. "Tomorrow I'll wake up and figure out what comes next." News Chopper 7 raw video (No audio). I spoke last night with Sandeep Kaushik, Burner's spokesman. He was with her most of the day. She, her husband, and little Henry are all doing well. Darcy is taking a few days off from the campaign to spend time with her family, and then will return. I am also deeply grateful for the expressions of support from friends, supporters and others who have called to express their condolences and offer their generous and heartfelt assistance. I am so moved by all of the offers of a place to stay, or clothes to wear, or all of the other offers of help that have poured in throughout the day. While we are fine for now, your kind expressions of support and concern have helped to sustain me through what has been a long and difficult day. For those who would like to do something to express their support, let me suggest making a contribution to your local humane society or animal shelter in memory of Charlotte, or to the Washington State Council of Firefighters Benevolent Fund. Thank you all for being there for us in my family's time of need. It means so much to us. Today was going to be day two of GNB's first ever fundraiser. We're going to push that back till tomorrow, and here's why. That's XML for Stop the War. It's what she was wearing around the house at 7 AM. David Goldstein and Kos both have wonderful posts up, the bottom line of which is this: Darcy needs a few days off. Due to the demands of modern campaigning, the only way she can take time off to be with her family is if we raise funds for her. I invite each of you to donate to Darcy. Because of federal campaign laws, we can't send Henry new toys or Darcy new clothes. But we can give her time with her family by letting her stay home a few extra days. Please give generously to Darcy's campaign today. And don't worry. Our scheduled GNB fundraiser will return tomorrow. 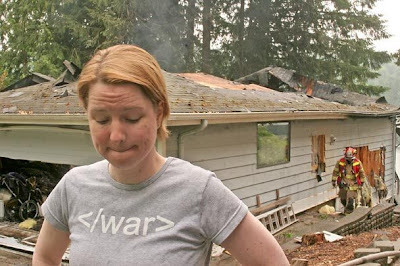 Darcy Burner outside her home which has just burned down. July 1, 2008. photo Ellen M. Banner/The Seattle Times. I like Darcy personally, but part of the job of politician's is to be likable. Anyway, I already chipped in $100 bucks, not because I'm endorsing anyone but because I think it's the right thing to do for someone who's just lost their home and damn near everything they own. Not out of GNB funds -- out of my personal account. I encourage people to give generously. I know her. She truly is one of our own. Markos at DailyKos has set the goal of raising $150,000 to take the burden off Darcy throughout all of July. As of 3 PM we're at $50K and climbing.